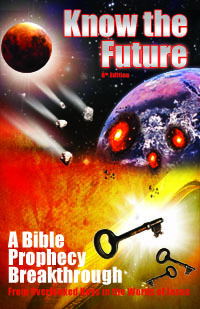 I wrote a book called Know the Future, that explains end time Bible prophecy comprehensively from literal Scripture. Ever since releasing this book, I have received tremendously positive feedback from readers thanking me and expressing how helpful, comforting and even life-changing the book has been for them. It has been extremely gratifying to make breakthroughs I wanted for myself and then to share them with other truth seekers who like me have been wanting for years or decades to understand God's end time plan to save his people. As a result of selling this book on my website, I receive another kind of feedback, from people who have not yet read the book. Upon seeing my book for sale, some Christians send very critical and judgmental emails. These Christians seem to think that everyone must teach the Bible for free because Jesus did. They are mad at anyone not doing the same. While it's true Jesus gave his teachings away for free, few understand why he did and misjudge others by an improper standard. Why Did Jesus Teach For Free? The reason Jesus taught for free was because he was given new revelation from God that he was told to give away freely. He also had the promise of the provision to support him as he did so, like all prophets (which prophet in the Bible had a job?). He repeated this same commission to his apostles--for a limited time which is now over (see below). They received freely from him and had to teach freely as his trained evangelists. However, unlike Jesus or the apostles, I am not a prophet. Likewise, I have no new revelation. Nor do I have the promise of supernatural provision to enable me to teach for free. Instead, I am only collating and explaining the literal prophecies of the future already in the Bible that real prophets wrote. This took serious time and dedication since the Bible is a big difficult book. New information that is only available now in the end times has been the key that has unlocked these prophecies now to this generation. Thus, what these Christians miss is, that the rules they perceive about revelation from God that Jesus and the prophets followed, do not apply to people like me merely explaining what those prophets said. Only prophets get revelation from God and to charge for what they monopolize would be limiting. Conversely, the information I share, anyone alive now can conceivably come up with just as I did the same way I did. They can read the Bible literally and carefully and put everything together if they take the time. Why must I charge? Since I have a family and I am not a supernaturally-provided-for prophet, I have the same problem as everyone else alive today. I need money to support my family. As such, I could not have justified putting so much time into my website and writing, revising and printing of my research as a book if it was not true I could get compensated. Thankfully I knew at the start that Jesus said that "the worker is worthy of his hire". In other words, he does not require I impoverish myself on some self-assumed quest to save the world (which would fail anyway). Some suggest that I do not need to charge but can just give away my work and accept donations. Unfortunately, I know from experience that this simply does not provide enough income. People are naturally apathetic and forget to pay for something they already have in their possession. But worse, this is not the way of provision taught in the Bible for God's servants. The Bible teaches the worker should be paid, no matter what his field, including specifically Bible teachers. Worse, asking for donations is essentially begging. I take it seriously that the Bible associates begging with wickedness, and says the righteous or their children are never seen begging for bread (Ps 37:25). Further, since my book is for the truth seeking-servants of God to whom Revelation is addressed (Rev 1:1), I have never worried about the small price tag being a significant barrier to entry. God's servants can pray for his help and God will answer (which I remind them to do). He told us to ask, seek, knock for what we need, knowing that God already knows our needs better than us before we ask (Mt 6:8; Mt 7:7). One man took my advice and found $30 while walking to work which he used to buy my book (because he could not find who lost it). He was very pleased with it (as are the vast majority). So, for some truth seekers, they actually develop their faith and relationship with God just in the very process of finding out about my research, getting excited about it and desiring it and then following through to acquire it. I'm proud to not enabling begging as the churches do, but teaching people as Jesus did to pray, ask, seek, knock of God instead for everything. "Freely Give, For Freely You Have Received"? You would be surprised if you check a commentary on what Jesus referred to when he told the 12, “Freely you have received; freely give.” He was NOT talking about the preaching or teaching (or by extension teaching by selling books)! We can know this for sure if you go down further where he tells them they are “worthy” of their hire/wages for that. The teaching they did came from their own mind and time and effort which it is fair for everyone to be paid for. So this “freely you have received/give” passage is not a universal instruction to all believers telling them they are not allowed to charge for anything related to the Bible or the truth, etc. as Christians love to wield it against each other. Hope this helps! Finally, my next book is in progress and is planned to be made free on my website. I can only make such plans because my first book sells enough to support my family. Later when the traffic rises and income from ads and donations are enough to replace my book income, I can eventually give all my books away for free. I plan this not because of judgmental hate mail from Christians who misunderstand Jesus' ministry (and you're never going to make everyone happy). Instead, I plan this because I have a heart to help all the "sheep without a shepherd" truth seekers out there and free is the best way to reach the most —once I am able without being worse than infidel in not taking care of my own (1Ti 5:8). You can find more information on your concerns here. I trust this article has addressed your concerns satisfactorily. Let me know if not. Friend, I don't want to offend you, but your tone from the start has not encouraged me that I can make you happy with anything I say. It frankly feels from all your insinuations and imputing of motives that you are condemning me for selling my work and there is nothing I can say that would make you happy short of renouncing selling my own work. So I'm limiting my responses as I have found in the past that these discussions either go endlessly or don't end well. If you want me to engage with you more, you'll have to soften your tone and approach. Sorry, if this upsets you. If you don't want to read the book, that's OK with me. But I don't think it fair to judge the book (or me) over disagreeing on the author wanting to protect his copyright, his work, and his family's income. I'll be honest that you will not come across as a reasonable person I can have a calm discussion with if you begrudge me that basic human right to control my property and do with it as I will. I hope this honest confession does not upset you. Also I hope if I share a passage this whole discussion reminds me of, it might help you and not offend you either. Sometimes people quote Scripture at others self-righteously. I only quote this to show you how it feels for me. Matthew 20:13-15 (HCSB) — 13 “He replied to one of them, ‘Friend, I’m doing you no wrong. Didn’t you agree with me on a denarius? 14 Take what’s yours and go. I want to give this last man the same as I gave you. 15 Don’t I have the right to do what I want with my business? Well Said. I can respect an answer like that, and will limit further questions to legitimate things relevant specifically to your work. To be fair to me, I was asked by both my dear friend (and you) for honest evaluation of the work, and you did include those messages in your book, both the exhortation for critique and the introduction to inform on those pirating your work ... which is extremely uncommon. I apologize if my tone offended you, I tend to come across that way. I just want honest answers, and it took a few tries! I too hold numerous copyrights... but I do not charge for my work, (and it is of professional quality) so I do have a bit of room to talk. I am a musician, but the same principle applies. Regardless, I appreciate your reply, and I do wish you well. I hope I may ask questions in the future, but if I'm bugging you, I understand, and will of course respect your wishes. I am most definitely not trying to tie you down with circular or pointless arguments! Thank you for changing your tact. Sure, I'll answer short questions (no essay tests, please =) when you finish the book. I'm not surprised at all to hear you have copyrights you give away for free. I tend to have the most problematic emails from people just like that. We all tend to naturally measure people by our own standards. We wonder if something is possible and easy for us, why is not everyone else doing it. I have found a key lesson in life to be that there are more gray areas or matters of preference/opinion/taste than we realize at first and that it's also OK for others to have a different preference and no need to make them wrong if their preference does not match ours.